Apostrophe Catastrophes: Insurance Against Bad Punctuation? At first it appears that the only problem with this sign, spotted in Davis Square, is that it has a misplaced comma. 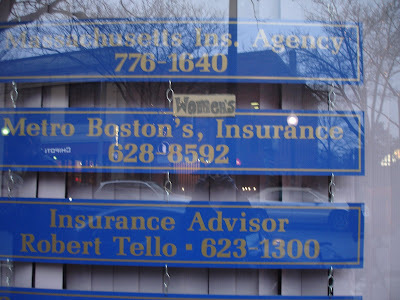 But Google tells me that the name of this company is Metro Boston Women's Insurance, so the sign also features an apostrophe catastrophe. Plus, adding "Women's" on a piece of cardboard is so tacky that I think they'd be better off just throwing this sign away entirely.